Atty. Glenn Chong said that a recent electoral Senate hearing was held. He was not part of it but Senator Tito Sotto’s Hybrid Election System recommendation was one of the topics. Sotto suggested this as the substitute for Smarmatic’s poll automation process. It was nothing to do with the anomalies during the elections. Fortunately, he was allowed to join to prevent the Comelec from bluffing the participants. He is grateful to the Senator for including the issue in his privilege speech. The public becomes aware of how the cheating manifests because such hearings are high profile in nature. This gives Chong the opportunity to reveal what he knew from 8 years ago until now. However, he needs the support of the people to heighten this case. 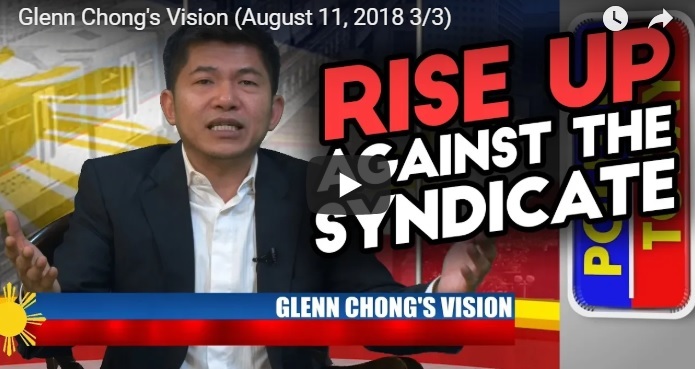 [VIDEO]: Glenn Chong’s Vision to use a Hybrid System for the upcoming 2019 election needs public support. Besides, Chong wants to watch over the Comelec during the recent electoral hearing. They might mislead the public again by telling incorrect information. They would surely justify their silence during the last two hearings if he is not around. This is by freely telling lies. It is very important to be a watchdog to bring out the truth, said the young Attorney. This time, some Comelec staff is eager to hear his side after the hearing. They ask him what he would like to achieve from this day forward. Chong replied that during the next hearing, he would lay down the security features needed. This is to ensure that the upcoming election in 2019 will be clean and can be trusted. Chong reminisces that within 8 years of questioning the Comelec, he’s often ignored. It’s a different story now after getting support from the people through social media. They knew that he’s not alone. The Filipinos are behind him who aspire for a dignified election. He said that each citizen has a voice. If they unite and fight for a common cause together, their rights won’t be abused. The people’s power comes from those small little voices that can be as powerful as the mighty abusers. Atty. Chong swears that he behaved well during the hearing. This is not to give the wrong impression to the foreign visitors from the United Kingdom. It would look unprofessional if Filipino political players would be in chaos while arguing about the anomalies. We can always wage our battles in a dignified way, he said. However, he did not fail to uncover a bit of the alleged digital election syndicate strategies. As President Rodrigo Du30 swears to make sure that the 2019 election is a clean one indeed, Chong thanked Senator Tito Sotto who talks about these fraudulent activities during his Senate speech. He is also grateful most of all to the people who give him the support and trust that he badly needs in toppling the powerful enemies of the land. Atty. Chong might be the most talkative clean election enthusiast but certainly, he’s not the only one. Many more groups are also joining the technical verification of what really happened when Bongbong Marcos’ one million votes lead declined significantly in a uniformed manner. The Philippine Society for IT professionals headed by Edmund Casino refers to Marcos as the real Vice President. Therefore, it’s just a matter of time that the Supreme Court would declare him as the recount winner against VP Leni Robredo. President Du30 is already hinting that his preferred successor could soon take his place. 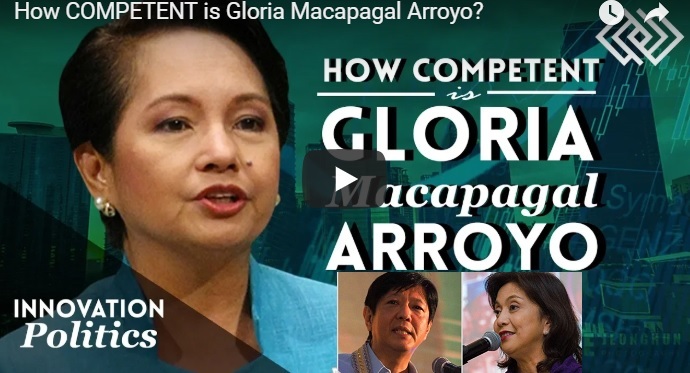 Congresswoman and now House Speaker Gloria Macapagal-Arroyo showed her competence in front of the world and America’s former President Barack Obama when it comes to the economy. She has turned the ailing economy of the country starting in 2001 when she assumed the presidency. Concrete economic infrastructures were created that spared the Philippines from the global economic crises in 2008. It would be beneficial if Arroyo can take over as temporary Vice President should the impeachment case against VP Leni Robredo pushes through. She is in the line of succession like Senate President Tito Sotto. 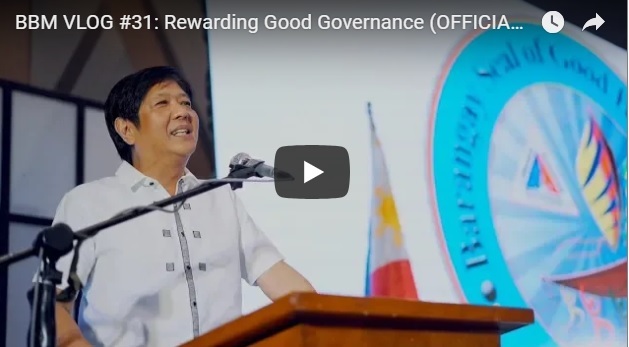 Bongbong Marcos even vouches on her achievements in setting up economic infrastructures in terms of investments, exports, and other financial facilities through his BBM Vlog 24. During the leadership of Former President Arroyo, she had made tough decisions. But these tough decisions made the Philippine Economy prosper. The GDP (gross domestic product) showed an average of 5.0% during her term from 2001 up to the first quarter of 2008. This focus on prowess in the handling of economy earned praise from her former classmate in Georgetown, former US President Bill Clinton. One of the toughest rules the Arroyo Administration implemented was the controversial e-VAT law. This was the centerpiece of her economic reform agenda. Implemented on November of 2005, It aims to help in raising revenue for the country’s large budget deficit. The administration targets to have a sound national budget by 2010. These measures helped to contribute to a stronger Peso by boosting confidence in the government’s fiscal capacity. It is no surprise that the Philippine Peso was the best performing currency in East Asia for 2005-06. In 2007, during Arroyo’s administration, the Peso’s value has raised by nearly 20%. This makes it Asia’s best-performing currency. This was made possible through the increased remittances of OFWs as well as the strong domestic economy Arroyo have cultured. Even with the growth of the GDP in place. Arroyo still has the drive to push these areas even further. The inflation has reached its highest for 17 years in August of 2008. The annual rates go as high as 12.5 percent compared from the record low 2.8 percent in 2007. As the fuel and energy prices went down, the inflation rate eased at 8.8 percent. Pnoy claimed achievements on the continuing GDP Growth during his time. But It was Arroyo who pushed to nurture jobs overseas for Filipinos as a choice and not the singular option. The economies of Brazil, Russia, India, China and South Africa are well known for their tremendous growth potential. They are called the BRICS club. These countries also have their share of economic and political woes. China has been the main force driving this group. China has transformed their economic structure from a focus on exports to an economy that relies on domestic consumption. During her administration, one of Arroyo’s successful achievements is the lower reliance on imports. Arroyo’s economic principles are clearly in line with the Marcos-Du30 partnership. She can also safeguard the VP post just in case Robredo is impeached or removed for whatever reason. “It’s the economy, stupid” is a slight variation of the phrase “The economy, stupid”, which James Carville had coined as a campaign strategist of Bill Clinton‘s successful 1992 presidential campaign against sitting president George H. W. Bush. Former President Gloria Macapagal-Arroyo’s version was telling Pnoy; It’s the economy, student. Meanwhile, Bongbong Marcos talks about the track record of now Speaker Arroyo when it comes to the infrastructure of the economy when she was President. He said that such leadership change including Senator Tito’s Sotto’s takeover as the Senate President is crucial for the progress of the country. 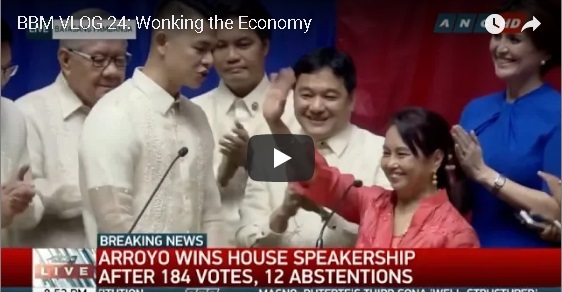 The anti-Arroyo faction must be outraged but former President Gloria Macapagal-Arroyo wins the house speakership post. She is the first female ever to be Speaker of the Philippines’ House of Representatives. The courageous woman is also the only former Philippine President to become speaker. While it is the first time in over a decade that in the middle of a President’s term the Speaker is replaced, Marcos is confident with Arroyo. There is no leader who has a greater sense of the economy as the former President, he said. Without hesitation, Pimentel had formally nominated Sotto as his successor. Sotto now serves as the second Senate president of the 17th Congress. The transfer of power had long been planned, Pimentel says as he resigned from the position. It is done so peacefully and willingly. With the development of artificial intelligence comes the elimination of some jobs. But surely with this technology, we can witness the evolution of most professional landscapes. As research predicts, 1.8 million jobs will be gone by 2020, but 2.3 million jobs would be created. While the AI technology will lead to the extinction of repetitive jobs, we can see it morph and enhance creative jobs. These things should be considered while looking at the economy, Marcos says. The peso is weakening. With weak Philippine trade numbers as well as expectations of an interest rate increase in the US, the peso remains weak against the dollar. This according to Jonathan Ravelas, Chief Market Strategist of BDO Unibank Inc. This will certainly work to the benefit of exporters and dollar earners, as well as the families of OFWs, Cid Terosa, Dean of the University of Asia and the Pacific School of Economics said. Arroyo still worries however of its future implications, Marcos says. The depreciation of the Peso Value on the flip side may spur inflation. That can negatively impact the purchasing power of the common Filipino. The electoral protest of Bongbong Marcos against VP Leni Robredo may still be uncertain. But now not only the President is Marcos-friendly. The heads of the Congress and the Senate are now on the same boat. The current line of succession to the office of the President of the Philippines is specified by the 1987 Constitution. During the Marcos era, the line of succession would be amended to include a newly created cabinet or ministerial offices. The line of presidential succession follows the order of Vice President, President of the Senate and the Speaker of the House of Representatives. In case of death, permanent disability, or inability of these officials, Congress shall, by law, provide for the manner of selection of the person who is to act as President until a President or Vice President shall have qualified. Atty. 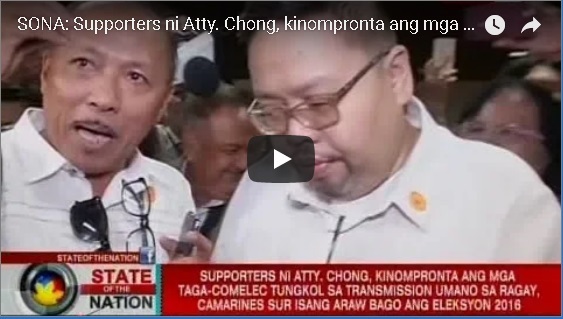 Glenn Chong pushes for answers from the Comelec and so do his followers. In fact, a group of his supporters confronts Comelec Spokesperson, James Jimenez on the early poll transmission issue. Almost immediately, Bongbong Marcos’ supporters follow suit. They gathered in a protest in front of the Comelec building recently. It seems that the Philippines is the only country that can transmit election results a day before the actual poll. A clear indication of a serious fraud that can divide the country. [VIDEO]: Kinuwestiyon ng isang grupo ang umano’y iregularidad sa 2016 elections dahil sa nangyari umanong transmission ng vote counting machine isang araw bago ang eleksyon. Pero giit ng Comelec, posibleng testing lang ang sinasabing transmission. An expert in IT, Edmund Casino tells that you can greatly influence the VP election results just by altering a simple code. This is evident in the drastic decline of Marcos’ lead when an illegal correction was introduced. However, as the Senate seek for Comelec’s ex-chair Andy Bautista and Smartmatic’s Marlon Garcia to address these issues, they seek asylum overseas. In Cory Aquino’s campaign against Ferdinand Marcos, Malloch-Brown had always supported behind the scenes. The snap elections did not go well for Aquino. But she became President after the famous “People Power” revolution. Malloch-Brown, in turn, assumed several duties in the international scene. He became Deputy Secretary General of the United Nations, UNDP Administrator, Development Specialist of the World Bank, British Minister of State for Asia, Africa and the United Nations in the Foreign Office, George Soros’s vice president at Quantum Fund and the Open Society Institute and a promoter of Western-supported “revolutions,” and life peer of the British empire as Baron Malloch-Brown. Malloch-Brown’s influence continues during the time of former leader BS Aquino III and beyond. Brown’s propaganda expertise is somewhat utilized by Aquino who now faces various lawsuits for his crimes against the people. Thus, it is easy for him to get away from the litigations necessary in the political sphere. This is obvious on the opposition’s aversion display to a truly free or clean election and the rise of a nationalist leader. VP Leni Robredo is used as a block against Bongbong Marcos to rise into power. Senator Tito Sotto says in his speech that election results were indeed ready prior to the race. Various precincts mostly in Camarines Sur are identified to have such developments He tells of Libon, Albay where voting machines were sending results in advance. This corresponds to Atty. Glenn Chong’s report that 459 precincts had results transmitted a day before the elections. He also possesses server logs showing these anomalous transactions. His investigation was separate from Sotto, nevertheless, they had similar findings. Smartmatic already has a shady background. Anomalies have been charged by countries such as The US, Brazil, Mexico, and Venezuela. President Rodrigo Du30 should exert his power to ban Smartmatic. He is the only one able to do so. As a start, the contract with Smartmatic for the upcoming 2019 elections should be rescinded. They should not be allowed to influence the next elections with their VCMs. We only have a year to clean up our electoral system and ensure a fair election. Chong floats the idea of a hybrid process which receives support from many lawmakers to avoid substantial expenses for the 2019 election.